Here are some assessments of the economic impact on the UK economy, over the short (business cycle horizon) to long run. 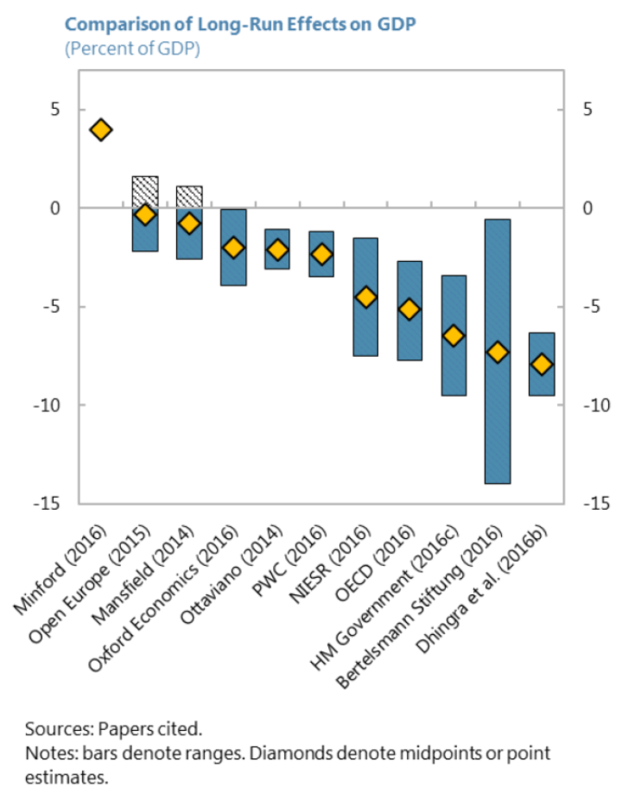 Table 2 from Angus Armstrong and Jonathan Portes, “Commentary: The Economic Consequences of Leaving the EU,” National Institute Economic Review No. 236 May 2016 . 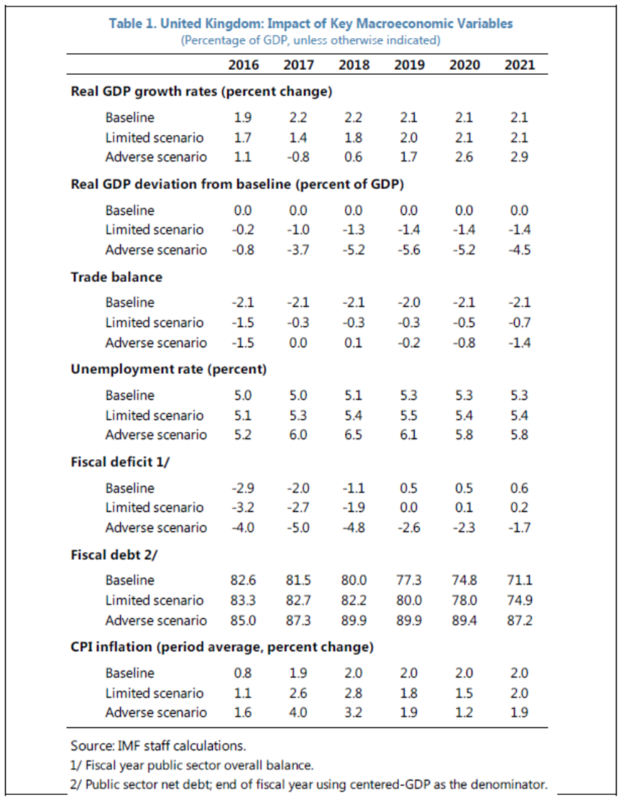 The IMF’s assessment came out in mid-June, and hence is not included in the above table; here’s the IMF’s view. 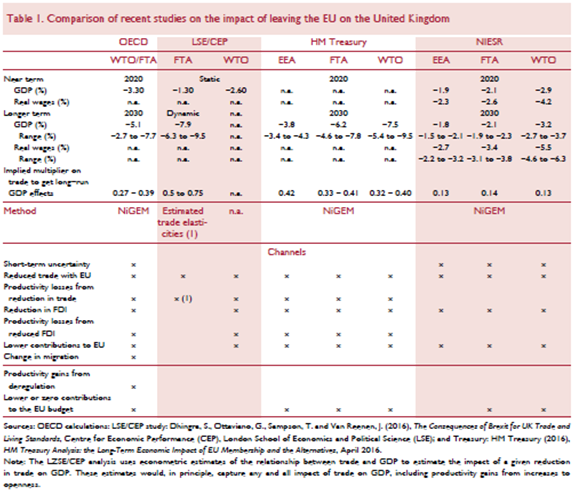 Table 1: from IMF, “United Kingdom-Special Issues,” IMF Country Report No. 16/169, June 17, 2016. These are detailed model-based assessments, expressed relative to a baseline. What are investment bank economists predicting in terms of actual levels, rather than deviations? Deutsche Bank does not forecast an outright contraction, expressed on a year-on-year basis. Source: “Special Report: Navigating in post-referendum Europe,” Deutsche Bank Research, June 23, 2016. Going forward, keep your eyes on Simon Wren-Lewis’s Mainly Macro blog. Update, 8:15AM Pacific: Reader Manfred cites Minford. Here’s a survey of the academic studies which places in context where Minford’s estimates stand. Source: IMF, “United Kingdom-Special Issues,” IMF Country Report No. 16/169, June 17, 2016. This entry was posted on June 23, 2016 by Menzie Chinn. There’s a million remain votes sitting on HRC’s email server. The scaremongering propaganda by the MSM did not prevail after all, you can stop calling the end of the world, Menzie. Or as the British say: after the Blitz 1940 we have lost all fear, even Juncker’s (this is the head of the EU mafia) ‘project fear’ keeps us stoic. Though Juncker’s EU gangster club and Merkel’s project ‘population change’ are more dangerous than Hitler’s Nazi Germany. John: Wirklich? More dangerous than Hitler’s Nazi Germany? Meinen Sie wirklich dass? I’ve been saying for a long time that as WWII slips further into the rear-view mirror, fewer people have an accurate idea of what german fascism was all about. Thank you, john, for the confirming evidence. It seems pretty obvious that voters’ concern about immigrants and refugees was a huge contributing factor to the 52% to 48% margin in favor of leaving the EU. And in regard to that concern, Austan Goolsbee, on MSNBC, had a very interesting comment. Great Britain has been one of the areas least impacted by refugees from the Middle East and Africa, but Great Britain voted to leave the EU. His question was what does that imply about future votes in areas on the Continent that have been more heavily impacted by refugees? Agreed. Except individual EU members may have more control over refugees than internal EU people movements. Things like this reminds me of the Bear Sterns/Leaman Bros where I had no idea of how their failures would cascade down the world economy. Another world shaking experiment? or a nothing burger? I would hate to see the United Europe Project fail. I would argue that this would not have happened if the EU had a Fiscal Accountability Act. If a given set of politicians cannot deliver growth, then the voters will call for a new set of politicians. If that doesn’t work, then they will call for yet another set of politicians. And some point, however, these issues become institutional. In Britain, the institutional question has become whether to remain or leave the EU. In the US, this is manifest as a repudiation of ‘establishment’ politics, both left and right. In both cases, voters are saying that existing institutional relationships are unsatisfactory. If you want growth, you need to pay politicians to deliver it. If you don’t pay politicians for growth, they will instead deliver rewards to constituents (re-allocating current resources) and place excessive emphasis on risk mitigation (red tape). In the democracies in Japan, the US and Europe, this appears to lead to low GDP growth rates over time, and that in turn may put the regime itself on the block. Steven, One error of analysis. EU leadership is not elected. It is the perfect unaccountable progressive creation. There’s more to life than economics. Freedom. Democracy. Sovereignty. Self-determination. It’s like the British re-read that letter we sent them back in 1776 and realized we were on to something. Menzie – John’s comment is silly. But there are reasonable people who disagree with you on the economic effects. Patrick Minford for starters. You may say whatever about him, but he is a long time econ prof (just like you), versed in the literature (just like you), and who supported Brexit. There will be turmoil and uncertainty in the short term, yes. The important issue is what the British do now with their independence from Brussels. “John” is actually a good example, why Brexit will mid to long term be a good thing. The EU suffers from too many people engaging in endless slander and hate mongering against the EU and especially Germany. do you believe germany will try to penalize great britain for leaving, as a way to deter others? or will germany wake up one day to realize they are the only one in “the club”? for instance, if there are to be two clubs in europe, will they align as axis and allies again? will france prefer to partner with great britain over germany? a unified europe is better than alliances. Nobody talks about punishment. And especially not Germany. The “only one” in the club is exactly England and nobody else, examplified by Cameron loosing his campaign against Juncker with 26/2/0 votes. Your “will france prefer to partner with great britain over germany?” shows that you understand very little about who wants what in Europe. France wants more integration, common budget, tax and social rules, defense, foreign policy. And most the times Germany sitting in the middle on the issues. England will just not get another favor. They got from the other 27 countries the last best offer, with again some special perks. England rejected it. And the slander coming from Cameron and the Brexiteers was just too much. You can not have Union with a member permanentely attacking the others and obstructing everything, and trying to destroy the core values, like the 4 freedoms. Thats it. The English should leave quickly and dont let the door hit them you from behind. now that great britain is gone, france and germany will be the two major powers at odds over a number of issues. can the two of you come to a common agreement? not sure. it appears, at least from your comments, that the german feeling is my way or the highway. that was the view with great britain. that was the feeling towards greece. now you still need to deal with spain and italy on the financial front. these other countries will start to ask the question, who can i strike a fairer deal with, germany or great britain? this is not a question anybody in the EU should want to ask. germany will have to compromise on a number of issues if it wants to hold the EU and eurozone together. and England rejecting the other 27. Or show me one example to the opposite. And if those others would like more financial sharing, and any other issue, England has not only nothing to offer, but demanded the opposite. i think you may be reading that vote incorrectly. the rejection was that they did not want to give great britain those special conditions in the EU while they themselves were imposed a different set of rules. but now that britain is out of the EU, the possibility exists some of those countries would rather be out of the EU with britain than remain in the EU with germany. especially because of some of the failures of the euro and ECB, there are countries who question their alignment with germany and the EU. Look, i do not want to see the EU disintegrate. But there have been some very hardline stances by germany, especially on the economic front. Membership has its privileges, but there have also been beatings. it is a matter of how much beating a country is willing to take. Even from the outside, many of those privileges can be negotiated-great britain has and will continue to show this is possible. without the beatings. Genauer I’m not sure what your point is. …the slander coming from Cameron and the Brexiteers was just too much. Far be it from me to defend Cameron (or as I prefer to call him, “Camoron”), but he opposed Brexit. So I don’t get why you are lumping Cameron and the Brexiteers together. That may well be true, but I don’t think it’s particularly relevant. Cameron and those who wanted to live in “Remainia” were not proposing closer political and foreign policy integration; they just wanted to maintain the basic economic arrangements under the EU without being in the EZ. And no one was saying that Britain had to be in the EZ. And as far as foreign policy independence goes, as a practical matter you probably couldn’t fit a tissue paper between the foreign policy differences of Britain, France and Germany. That’s what 43 years of economic integration will get you. As I understand it, a certain class of British politicians and media moguls whipped up a bunch of low information voters by getting them to believe that evil and smelly Turks were going to invade the cliffs of Dover any day now. Lazy immigrants and refugees would overwhelm the NHS. Working class Brits would lose jobs to “those people” just as working class whites in North Carolina would lose jobs to “those people” if a moderate Democrat won an election seat. The barbarians hordes were at the beaches! Who knows…the monarchy might even have been replaced by Sharia Law and a caliphate. Nitwit voters were fed this line of crap and they fell for it, just as they fall for it here in places like Kansas. England (and here I do mean England and not Britain) could (for once) have done well with a little more class consciousness. The economic interests of labor and the political interests of Labour were in Remain, but false consciousness prevailed. Now workers will be worse off. Germany’s sins and shameful behavior are mostly with the EZ and ECB, not the EU. the vote by age demographics was interesting. from recent polling data, those aged 44 and above voted to leave. those under 44 voted to stay-by a significant margin. i fully understand in a democracy the vote counts irregardless of age (except under 18). however, the younger crowd are the ones that must live the longest with this decision, and if it turns out to be a negative, what will be the social ramifications? if i were a young up and coming entrepreneur in great britain, i would be rather angry at the demographics of this vote. European regulations were more of a wet blanket on productivity growth than commonly recognized. A comparison between the EU and the U.S. before the 2008 Recession gives some insight into the British compulsion to exit, I think. Consider http://www.westga.edu/~bquest/2007/productivity7.pdf . This just depends on your arbitrary starting point. Your graph shows per capita GDP growth while mine are showing labor productivity growth. There really isn’t any contradiction. I wish more economists had some real-life experience. Or at least some common sense. What matters in regulation is not how many regulations there are, but how sensible they are. In the US pharmaceutical industry, which in its early days caused many unnecessary deaths by its libertarian practices, regulation of the production process has been aimed at helping the company understand and control the process to produce a reliable product. Regulation of the clinical testing side has been aimed at producing meaningful data so that the manufacturer knows whether their drug is saving or killing people. Remarkably, the industry did not find it useful to do either one without a push from the government. Result: the pharmaceutical industry thrived. In the broader chemical industry, as another example, regulation was aimed at keeping the industry from killing its workers and the general populace. Many companies embraced the principle and found that they were able to get higher production yields and lower waste disposal costs. But even if this had not happened, the national health improved. But a few. like West Fertilizer, took advantage of how thin regulators are stretched to operate with maximum freedom. One can see the results of total freedom in Bhopal, India, still, three decades later. Obviously if regulations con’t accomplish anything, they shouldn’t exist. But usually regulations are designed to do something. When they become silly, as with so-called “featherbedding”, sometimes it’s because there’s an actual problem (e.g., layoffs) that could be dealt with more sensibly (like, funds for re-training). Sure, there are bureaucrats who defend their importance by coming up with problems that don’t exist. But more often, there are real problems that need good faith discussion and negotiation to resolve. It would be nice to see some good faith on the side of those who hope to profit by cutting regulations. There is one aspect of regulation that is often overlooked: increasing the cost of competing. Large, established corporations love regulations because it increases the cost of entry. Certainly, safety issues are important. But often the bureaucratic processes associated with the regulations are a major deterrent. It’s difficult to assess how much of Remain was corporate efforts to reduce competition through increased regulation and how much was because markets were more accessible. Some in Britain have argued that the process for trade agreements outside the EU were hamstrung by membership in the EU. Again that’s difficult to assess the extent. Here’s a link to a talk by Daniel Hannan, MEP, who brings aspects of the Brexit into focus. Naturally, there are those who disagree by name-calling, but it would be more informative to address the points he was making. While I agree that regulations can be–and are–used as barriers to entry, there are plenty of ways to facilitate the entry of smaller businesses into a a market. The SBIR program is one example. A progressive corporate income tax is another. Regulations are really negligible factors relative to factors enjoyed by big business such as cost of capital and attractiveness of stable employment to employees. It’s hardly name-calling to state a fact, namely that most people who rant against regulations have never worked in a heavily-regulated industry and therefore don’t know what they are talking about. A crude, English John Stewart is convincing? Surely, you jest. Of course, he is good at taking small sound bites and then twisting them into weak mockery. Certainly unfettered immigration is a sore point to the British workers whose wages and jobs have been undercut, but that was not the central, or even one of the important points of Hannan’s talking points. Sorry you didn’t get the video to work. Regardless, it will be an interesting few years for both the EU and GB. I suspect there may be various policy changes in the EU regarding the mass distribution of refugees which has been a particularly sore spot for eastern EU nations as well as the dominance of NW Europe in financial and trade policy. Certainly, the “unaccountability” factor raised by Hannan will have to be addressed eventually. As the EU has become a declining share of GB’s trade, the inflexibility of the EU with regard to member nations’ individual desires in that area makes trade independence increasingly attractive. Yes, the EU markets are very important to GB and there will be some degree of adjustment to continue that, but Hannan cites several examples of EU restricting GB’s trade wishes as a counterpoint to that. Divorces can be messy, but they don’t all end up as lose-lose. Economics is not a zero-sum game. Menzie is right in recommending Simon Wren-Lewis. Putting his basic arguments in terms that Chris Dillow might well appreciate, what we have here is a classic case of false consciousness on the part of “Leavonia” voters. They got hoodwinked into thinking that immigration was the root of their problems even though the economic data argues that immigration helped prop up the NHS. Cameron & Osbourne played the old bait-and-switch game so long that voters started to take the race baiting distraction seriously when someone who wanted Cameron’s job decided a little con job was just the ticket needed to become the next PM. There are uncomfortable similarities between the GOP’s years of dog whistles coming home to bite (do dog whistles bite?) and the Tory party’s use of immigrants to deflect attention from its own policy mistakes. Years of GOP dog whistles gave them Donald Trump. Tory party lies have given them Boris Johnson. Boris and Donald…peas in a pod. It all looks so negative, unless Great Britain manages to negotiate a special economic and financial arrangement. Then things might not look so negative. There is significant value at stake here. Great Britain will likely continue close economic and financial ties with the EU. It all looks so negative, unless Great Britain manages to negotiate a special economic and financial arrangement. This is tantamount to saying that things won’t be so bad if Britain finds a way to effectively undo Brexit by sneaking in the status quo through the back door. But by then we’re likely talking about a “rump Britain” of Wales and England only. … The EU is a supranational government run in a fundamentally undemocratic, indeed antidemocratic, way. It has four presidents, none of them elected. Power to initiate legislation rests entirely with an unelected commission. Its court can overrule our Parliament. Britain—the most outward-facing of the major European economies—will thrive if it leaves. Europe’s GDP has only just staggered back up to where it was before the 2008 financial crisis….This is because the EU’s obsession with harmonization (of currency and rules) frustrates innovation. …the corridors of Brussels are crawling with lobbyists for big companies, big banks and big environmental pressure groups seeking rules that work as barriers to entry for smaller firms and newer ideas. The Volkswagen emissions scandal came from a big company bullying the EU into rules that suited it and poisoned us. The anti-vaping rules in the latest Tobacco Products Directive, which will slow the decline of smoking, came from lobbying by big pharmaceutical companies trying to defend the market share of their nicotine patches and gums. The de facto ban on genetically modified organisms is at the behest of big green groups, many of which receive huge grants from Brussels. Asked by pollsters why they had voted to leave the EU, some said it was immigration. But more said that it was the question of democracy. This is a word that seems to mean very little to the academics….and yet, strangely, means a great deal to those whose access to it is most limited – the greater mass of the British public. Teh obvious contradiction is that some of the reason for Brexit were simple lies – UK can not reduce EU immigration without losing access to the EU – when people buy these lies and vote for Brexit, then it is interesting that you sell this as a positive aspect of democracy. It tells me more about the power of Murdoch et al. and the willingnes to follow then. Yes. God save the quenn. BTW: Your “economic” argument is an outlier and in many fuield s does not survive contact with reality. But you will learn this, after you have left. BTW When will this happen?